The payload bay of STS-129 (ISS ULF-3 ELC-1 ELC-2) carried two large ExPRESS Logistics Carriers holding two spare gyroscopes, two nitrogen tank assemblies, two pump modules, an ammonia tank assembly, a spare latching end effector for the station's robotic arm, a spare trailing umbilical system for the Mobile Transporter, and a high-pressure gas tank. STS-129 was the first flight of an ExPRESS Logistics Carrier. 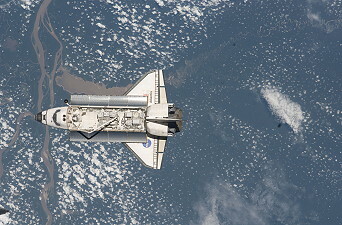 While docked to the station, Atlantis' crew conducted three spacewalks to transfer the spare parts from the shuttle's payload bay to the station's external structures and continue assembly activities. 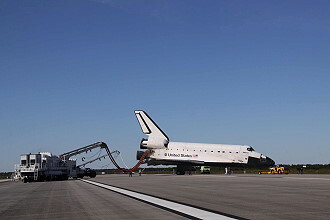 At the end of the 11-day flight, Atlantis also brought home Expedition 20 and 21 Flight Engineer Nicole Stott, the final astronaut to use a space shuttle for a lift to or from the station. The ExPRESS Logistics Carrier (ELC) is a platform designed to support external payloads mounted to the International Space Station (ISS) starboard and port trusses with either deep space or Earth-ward views. Each pallet spans the entire width of the shuttle's payload bay, carries science experiments, and serves as a parking place for spare hardware that can be replaced robotically once on-orbit. 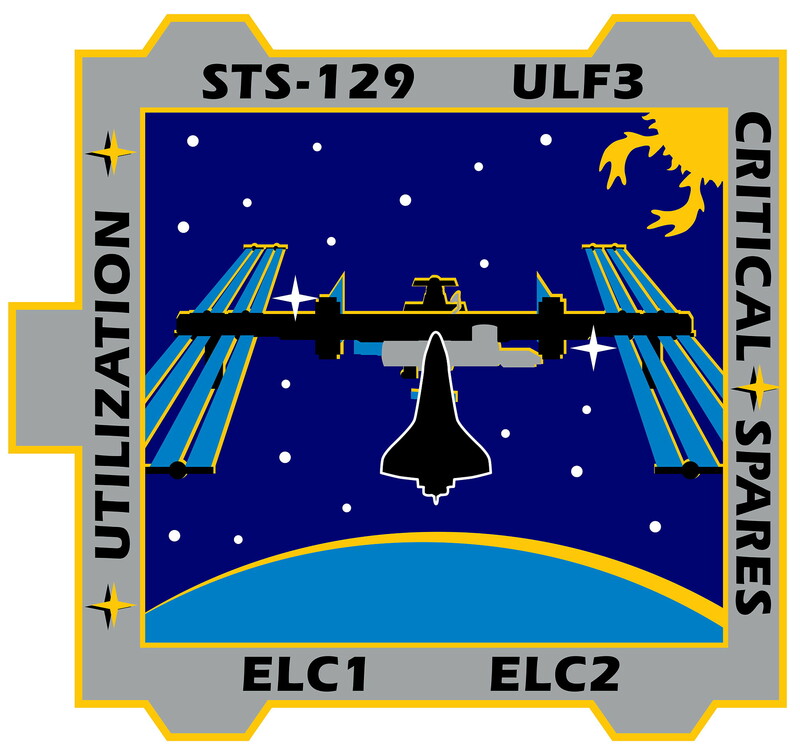 STS-129/ULF3 will mark the first flight of ELC 1 and 2. 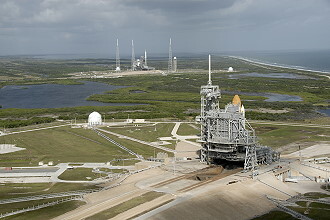 ELC 1 and 2 are grappled by the space shuttle and station robotics arms and are placed on the station's truss structure. ELC 1 is mounted on the Port 3 truss element UCCAS while ELC 2 is placed on the Starboard 3 truss upper outboard PAS. The UCCAS and PAS were deployed during the STS-128 mission. The weight of ELC 1 is approximately 13,850 pounds (6,282 kg); ELC 2 weighs 13,400 pounds (6,078 kg). Both ELC 1 and 2 measure approximately 16 feet (4.9 meters) by 14 feet (4.3 meters) (without the ORUs installed). Because of their expertise in building the Hubble Space Telescope (HST) cargo carriers, NASA Goddard Space Center served as the overall integrator and manufacturer for ELC 1 and 2. Remmele Engineering, based in Minneapolis, Minn., built the integral aluminum ELC decks for NASA. Engineers from GSFC's Carriers Development Office developed the challenging, lightweight ELC design, which incorporates elements of both the Express Pallet and the Unpressurized Logistics Carrier. The ELC is designed to be carried in the space shuttle cargo bay to the ISS, fully integrated with cargo and/or payloads. Four ELCs were delivered to ISS before the scheduled retirement of the space shuttle. Two ELCs are attached to the starboard truss 3 (S3) and two ELCs are attached to the port truss 3 (P3). By attaching at the S3/P3 sites, a variety of views such as zenith (deep space) or nadir (Earthward) direction with a combination of ram (forward) or wake (aft) pointing allows for many possible viewing opportunities. Each ELC can accommodate 12 Flight Releasable Attachment Mechanism (FRAM)-based cargos that includes two payload attached sites with full avionics accommodation. The mass capacity for an ELC is 9,800 pounds (4,445 kg) with a volume of 98 feet (30 meters) cubed. The ISS provides power to the ELCs through two 3 Kilowatt (kW), 120 Volts direct current (V dc) feeds at the ISS to ELC interface. The ELC power distribution module converts the 120 V dc power to 120 V dc and 28 V dc. Both power voltages are provided to each payload attached site by separated buses. 120 V dc power is also provided to the other cargo attached site. Upon installation of the ELCs, it may take up to 4 hours for the power to be connected. A total of 14 large Orbital Replacement Units (ORUs) are being carried on ELC 1 and 2. All of the hardware for this mission was processed by Boeing under its Checkout, Assembly and Payload Processing Services (CAPPS) contract with NASA. 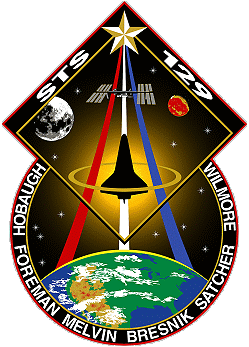 The STS-129 mission marks the largest number of spare ORUs processed in a single mission under the CAPPS contract. The ORUs include the Ammonia Tank Assembly (ATA), Battery Charger Discharge Unit (BCDU), Cargo Transportation Container (CTC), two Control Moment Gyroscopes (CMG), High-Pressure Gas Tank (HPGT), Canadarm2 Latching End Effector (LEE), Materials International Space Station Experiment 7 (MISSE-7), two Nitrogen Tank Assemblies (NTA), Plasma Contactor Unit (PCU), two Pump Module Assemblies (PMA) and a Trailing Umbilical System-Reel Assembly (TUS-RA). The primary function of the ATA is to store the ammonia used by the External Thermal Control System (ETCS). The major components in the ATA include two ammonia storage tanks, isolation valves, heaters, and various temperature, pressure, and quantity sensors. There is one ATA per loop located on the zenith side of the Starboard 1 (Loop A) and Port 1 (Loop B) truss segments. Each is used to fill their respective ETCS loop on startup (loops are launched with nitrogen in the lines) and to supply makeup fluid to that loop. It also assists the Pump Module (PM) accumulator with ammonia inventory management, and provides the capability to vent the PM and ATA by connection to an external nonpropulsive vent panel. The length is 57 inches by 80 inches (145 by 203 centimeters) width with a height of 45 inches (114 centimeters). A new ATA, with 600 pounds (272 kg) of Ammonia, weighs approximately 1,702 pounds (772 kg). The Battery Charge Discharge Unit (BCDU) is a bidirectional power converter that serves a dual function of charging the batteries during solar collection periods (isolation) and providing conditioned battery power to the primary power buses during eclipse periods. The BCDU has a battery charging capability of 8.4 kW and a continuous discharge capability of 6.6 kW (9.0 kW peak). The BCDU also includes provisions for battery status monitoring and protection from power circuit faults. The BCDU measures approximately 40 inches by 28 inches (102 by 71 centimeters) by 12 inches (30 centimeters) and weighs 235 pounds (107 kg). There are 24 BCDUs on orbit that are used for normal Power System operation. Both the Russian and U.S. segments can maintain attitude control. When the Russian segment is in control, attitude is maintained by thrusters, which consume propellant. When the U.S. segment is in control, Control Moment Gyroscopes, manufactured by L3 Communications Space and Navigation under contract to Boeing, are used. The set of four CMGs balance the effects of gravity gradient, aerodynamic, and other disturbance torques (i.e., robotics, venting, and plume impingement), maintaining the station at an equilibrium attitude without using propellant. The CMGs can also be used to perform attitude maneuvers. The CMGs rely on electrical power provided by the solar powered electrical subsystem. A CMG consists of a single-piece 25-inch (63 centimeters) diameter, 220-pound (100 kg) stainless steel flywheel that rotates at a constant speed of 6,600 rpm and develops an angular momentum of 3,600 ft-lb-sec (4,880 N-m-s) about its spin axis. This rotating wheel is mounted in a two-degree-of-freedom gimbal system that can position the spin axis (momentum vector) of the wheel in any direction, allowing control torque generation in any direction. The station has four working CMGs that are mounted in the Zenith 1 truss segment. Each CMG assembly weighs approximately 600 pounds (272 kg) and measures 45 inches (114 centimeters) wide, 48 inches (122 centimeters) high, and 54 inches (137 centimeters) in length. The Canadian Mobile Servicing System (MSS), a space robotics system astronauts and cosmonauts use to assemble and maintain the International Space Station, consists of the Canadian Space Station Remote Manipulator System (SSRMS) or Canadarm 2, the Mobile Base System (MBS) and the Special Purpose Dexterous Manipulator (SPDM) or Dextre. The SSRMS has two identical grapple end points called LEE that enable it to reattach either end to the station as its new base. It moves in inch worm fashion around the U.S. segment by placing one end on a mounting point and disengaging its other end and using it to grapple a payload or another mounting point. Each mounting point provides power and data to the SSRMS. The NTA provides a high-pressure gaseous nitrogen supply to control the flow of ammonia out of the ATA. The ATA contains two flexible, chambers incorporated into its ammonia tanks that expand as pressurized nitrogen expels liquid ammonia out of them. Designed by Boeing's Huntington Beach facility in California, the NTA controls ammonia pressure in the ATA as a key part of the External Active Thermal Control System, an external system that circulates ammonia to cool ISS segments. 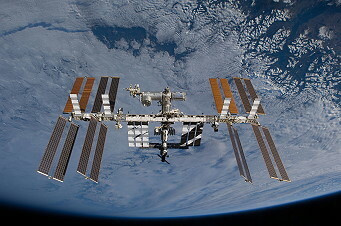 As the International Space Station (ISS) travels through Low Earth Orbit (LEO), an electrical charge builds. This phenomenon can result in high voltages that may cause electrical discharges. These discharges, in turn, can damage precise electrical instruments and can also present a hazard to crew members performing EVA. The Plasma Contactor Unit (PCU) is used to disperse the electrical charge that builds up by providing an electrically conductive "ground path" to the plasma environment surrounding the ISS. This prevents the electrical discharges and provides a means of controlling crew shock hazard during EVA. 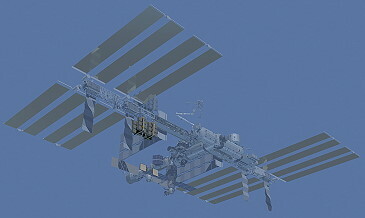 There are two PCUs located on the ISS Zenith 1 Truss, both of which are operated during EVA. The PMA is part of the station's complex Active Thermal Control System (ATCS), which provides vital cooling to internal and external avionics, crew members, and payloads. The station has two independent cooling loops. The external loops use an ammonia-based coolant and the internal loops use water cooling. At the heart of the ATCS is the pump module, which pumps the ammonia through the external system to provide cooling and eventually reject the residual heat into space via the radiators. The heat is generated by the electronic boxes throughout the station. Circulation, loop pressurization, and temperature control of the ammonia is provided by the Pump Module (PM). The major components in the PM include a Pump and Control Valve Package (PCVP), an accumulator, isolation and relief valves, and various temperatures, flow, and pressure sensors. The accumulator within the PM works in concert with the ATA accumulators to compensate for expansion and contraction of ammonia caused by the temperature changes and keeps the ammonia in the liquid phase via a fixed charge of pressurized nitrogen gas on the backside of its bellows. Manufactured by Boeing, the pump module weighs 780 pounds (354 kg) and measures approximately 5.5 feet (69 inches= 167 centimeters) long by 4 feet (50 inches = 122 centimeters) wide with a height of 3 feet (36 inches = 91 centimeters). The Materials on International Space Station Experiment 7 (MISSE-7) is a test bed for advanced materials and electronics attached to the outside of the International Space Station (ISS). Results will provide a better understanding of the durability of advanced materials and electronics when they are exposed to vacuum, solar radiation, atomic oxygen, and extremes of heat and cold. These materials and electronics, including solar cells, coatings, thermal protection, optics, sensors, and computing elements, have the potential to increase the performance and useful life of the next generation of satellites and launch systems. The samples are installed in experiment trays within two Passive Experiment Containers (PECs), which are opened on-orbit. Astronauts installed the PECs, 7A and 7B, to the MISSE-7 support base during an EVA. Each PEC holds samples on both sides, with PEC 7A orientated zenith/nadir (space facing/Earth facing), and PEC 7B oriented ram/wake (forward/backward) relative to the ISS orbit. MISSE-7 also includes electronic experiments in boxes mounted directly to the MISSE-7 support base. The MISSE program has a rich history of testing advanced materials on ISS. MISSE-1 and 2 were delivered to ISS on STS-105 in August 2001 and returned on STS-114 in August 2005. MISSE-5 was deployed on STS-114 in July 2005 and returned on STS-115 in September 2006. MISSE-3 and 4 were delivered to ISS on STS-121 in July 2006 and returned on STS-118 in August 2007. MISSE-6A and 6B were delivered to the ISS on STS-123 in March 2008 and returned on STS-128 in September 2009. MISSE-7 is the latest and most advanced of the MISSE payloads, and will be the first to receive power directly from the ISS and use the ISS communication system to send commands and downlink real-time data. The Mobile Transporter (MT) is a cart-like assembly that moves up and down rails along the ISS integrated truss. It provides mobility and the structural load path for the Canadian Mobile Base System (MBS) and the Canadian robotic arm (Space Station Robotic Manipulator System). The power and data to operate the MT and the video and data provided to (and from) the MBS/SSRMS, routes through a set of redundant cables that are part of the Trailing Umbilical System (TUS). The TUS Reel Assembly (TUS-RA) is basically a large spool much like a garden hose reel that pays out cable when the MT moves away and rolls it back up as the MT returns to the center of the truss. The TUS system was equipped with blade cutter devices (one for each cable) that can remotely sever the cable. However, due to anomalous behavior with this feature of the TUS system, this capability was removed on Flight ULF1.1 (STS-121). The MT is used for assembly of large elements of the station. It must be latched down at various work sites before the robotic arm can operate. When the MT is latched down after translating, power is provided through the Umbilical Mechanism Assembly (UMA) system hardware to the SSRMS and several components on top of the MBS. At the worksites, the MT/MBS/SSRMS is much more structurally secure and the active half of the UMA on the MT mates with the passive half at the work site. NASA flight rules require both TUS cables to be intact before translating anything attached to the MT. The MBS is a base platform for the robotic arm. The platform rests atop the MT, which allows it to glide down rails on the station's trusses. When Canadarm2 is attached to the MBS, it has the ability to travel to work sites along the truss structure. The top speed of the Mobile Transporter is about 2.5 cm per second. The proper and complete name of the MBS is the "MRS Base System", where MRS stands for "Mobile Remote Servicer". It is made out of aluminum and is expected to last at least 15 years. 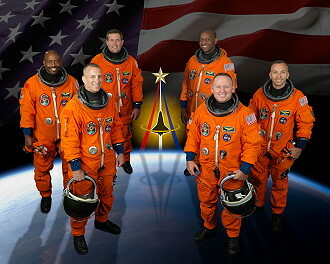 The crew members aboard space shuttle Atlantis began their first full day in space at 09:28 UTC. 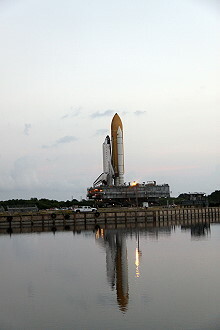 The day was primarily devoted to inspect Atlantiss thermal protection system to look for any signs of launch damage. Using the shuttle's robotic arm and the Orbiter Boom Sensor System (OBSS), the crew performed a six-hour inspection of the reinforced carbon nose cap and wing leading edge panels of the shuttle. After releasing its grasp on the inspection boom, the robotic arm grappled the ExPRESS Logistics Carrier 1 (ELC-1) as a preparatory step for installation on Flight Day 3. While the inspection took place, Randolph Bresnik, Michael Foreman and Robert Satcher prepared the spacesuits they had to wear for the three spacewalks to be conducted out of the Quest airlock at the station. As Michael Foreman and Robert Satcher prepared the spacesuits for transfer to the station, Randolph Bresnik joined the heat shield inspection team. Other pre-docking preparations occupied the remainder of the crew's workday. When Atlantis launched on the STS-129 mission, it flew on a trajectory to chase the International Space Station. 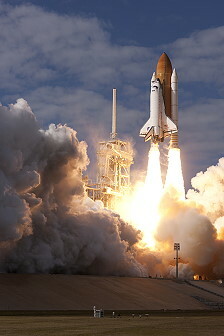 A series of engine firings during the first two days of the mission brought the shuttle to a point about 50,000 feet (15,240 meters) behind the station. 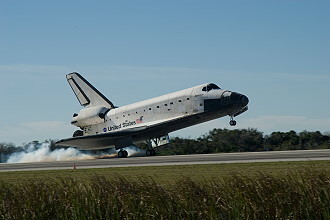 Once there, Atlantis started its final approach. About 2.5 hours before docking, the shuttle's jets were fired during what is called the terminal initiation burn. The shuttle covered the final miles to the station during the next orbit. As Atlantis moved closer to the station, its rendezvous radar system and trajectory control sensor provided the crew with range and closing-rate data. Several small correction burns placed the shuttle about 1,000 feet (304.8 meters) below the station. Commander Charles Hobaugh, with help from Pilot Barry Wilmore and other crew members, manually flew the shuttle for the remainder of the approach and docking. 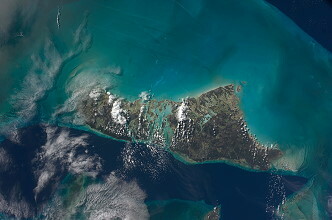 Charles Hobaugh stopped Atlantis about 600 feet (182.9 meters) below the station. Once he determined there is proper lighting, he maneuvered the shuttle through a nine-minute back flip called the R-bar Pitch Maneuver (RPM). During this maneuver, station crew members Jeffrey Williams and Nicole Stott used digital cameras with 400 mm and 800 mm lenses to photograph Atlantis's upper and bottom surfaces through windows of the Zvezda Service Module. The 400 mm lens provided up to three-inch (7.6 centimeters) resolution and the 800 mm lens up to one-inch (2.5 centimeters) resolution. Frank De Winne used the 400 mm and Jeffrey Williams used the 800. 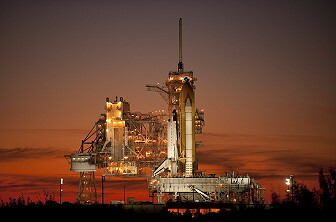 The photography was one of several techniques used to inspect the shuttle's thermal protection system for possible damage. Areas of special interest included the thermal protection tiles, the reinforced carbon-carbon of the nose and leading edges of the wings, landing gear doors, and the elevon cove. The photos were downlinked through the station's Ku-band communications system for analysis by systems engineers and mission managers. When Atlantis completed its back flip, it was back where it started, with its payload bay facing the station. Charles Hobaugh then flew the shuttle through a quarter circle to a position about 400 feet (121.9 meters) directly in front of the station. From that point he began the final approach to docking to the Pressurized Mating Adapter 2 at the forward end of the Harmony node. The shuttle crew members will operate laptop computers that process the navigational data, the laser range systems, and Atlantis's docking mechanism. Using a video camera mounted in the center of the Orbiter Docking System, Charles Hobaugh lined up the docking ports of the two spacecraft. He paused the shuttle 30 feet (9.14 meters) from the station to ensure proper alignment of the docking mechanisms. He maintained the shuttle's speed relative to the station at about one-tenth of a foot per second (3 centimeters per second), while both Atlantis and the station were moving at about 17,500 mph (28,163 km/h). Charles Hobaugh kept the docking mechanisms aligned to a tolerance of three inches (7.6 centimeters). When Atlantis made contact with the station on November 18, 2009, preliminary latches automatically attached the two spacecraft. The shuttle's steering jets were deactivated to reduce the forces acting at the docking interface. Shock absorber springs in the docking mechanism dampened any relative motion between the shuttle and station. Less than two hours later, hatches opened between the two spacecraft and a combined crew of 12 began almost seven days of work between the two crews. Atlantis' crew was working with Expedition 21 commander Frank De Winne of the European Space Agency, and NASA Flight Engineers Jeffrey Williams and Nicole Stott, Canadian Flight Engineer Robert Thirsk, and Russian Flight Engineers Roman Romanenko and Maksim Surayev. 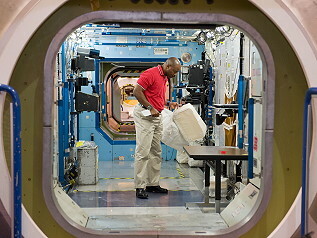 After a station safety briefing, Leland Melvin and Randolph Bresnik grappled ELC-1 using the shuttle's robotic arm and handed it off to the station's arm, operated by Jeffrey Williams and Barry Wilmore, who then installed it on an Unpressurized Cargo Carriers Attachment System (UCCAS) on the port side of the station's backbone. 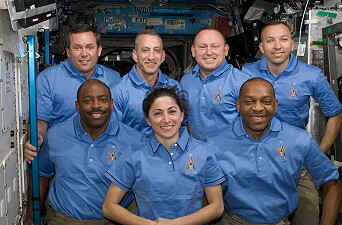 With hatch opening Nicole Stott became as MS-5 member of the STS-129 crew for returning to the Earth. She was the last ISS crewmember returning by a Space Shuttle. 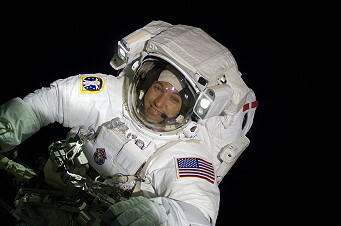 Robert Thirsk from CSA was originally slated to return from his stay aboard the station with STS-129, but due to flight delays, it was announced that Nicole Stott and Robert Thirsk would swap return seats, with Nicole Stott returning aboard STS-129, and Robert Thirsk returning on Soyuz TMA-15. 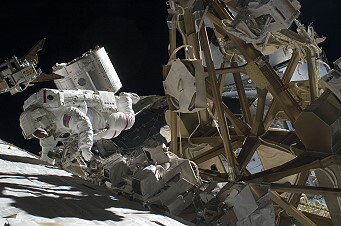 The first EVA was performed by Michael Foreman and Robert Satcher on November 19, 2009 (6h 37m) to install a spare antenna on the station's truss, or backbone, and a bracket for ammonia lines on the Unity module. They lubricated the grapple mechanism on the Payload Orbital Replacement Unit Attachment Device on the Mobile Base System and lubricated the snares of the hand of the station's Japanese robotic arm. This work was done earlier than planned. They used this time for deploying the Payload Attach System (PAS) on the Earth-facing side of the Starboard 3 truss, the crew had difficulty loosening a bolt and removing a diagonal brace on the PAS. After hammering on a bolt and wiggling the brace, they successfully deployed the PAS and reinstalled the brace. This additional task was originally planned for EVA 2. Most of the spare parts brought up by space shuttle Atlantis was installed onto the space station's truss robotically, but a few needed spacewalker intervention. The first of those to be installed on the station was the spare S-band antenna structural assembly. Michael Foreman and Robert Satcher began the first spacewalk of the mission by moving it from the space shuttle's cargo bay to the Z1 segment of the station's truss system. For the transfer, Robert Satcher was doing the heavy lifting, with the help of the station's robotic arm. He climbed onto the robotic arm from the S1 segment of the station's truss, then had Charles Hobaugh "drive" him to the shuttle's cargo bay. There Michael Foreman was working to remove the assembly from its launch position by releasing four launch restraints, loosening two bolts and removing two caps from the antenna's connections. He then helped Robert Satcher lift it out of the cargo bay to begin the journey to the station's truss. Before meeting Robert Satcher at the Z1 truss, Michael Foreman retrieved a bundle of cables for another of the station's antennas and two ingress aids from a toolbox in the cargo bay. He installed one of the ingress aids on a workstation interface at the airlock and stowed the other inside the starboard crew and equipment translation aid - or CETA - cart. Then he continued the installation of the antenna assembly by connecting its two cables to the Z1 truss segment and driving two bolts. The two spacewalkers split up for the rest of the spacewalk. Michael Foreman installed a set of cables for the station's future space-to-ground antenna and secure its path along the Destiny laboratory with wire ties. He also removed a handrail on the Unity node and replaced it with a bracket that will be used to route an ammonia cable required for the coming Tranquility Node. Removing the handrail required Michael Foreman to unscrew two bolts, and he drive two bolts to secure the new bracket. Michael Foreman's final tasks on the spacewalk were repositioning a cable connector on the Unity node by wire-tying it into place and, at the same location, removing adjustable equipment tethers from a micrometeoroid orbital debris shield and securing it with wire ties. He also was troubleshooting the connection of a cable on an S0 panel. The previous flight, STS-128, had difficulty connecting this cable, which is needed for the activation of the Tranquility Node. Michael Foreman troubleshooted the connector and used an adaptor to mate the cable to the backside of the S0 panel. Meanwhile, Robert Satcher worked with two of the station's robotics tools. 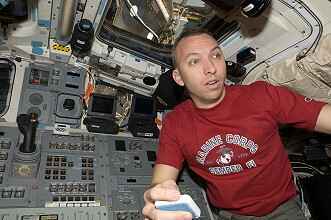 He started at the mobile base system that allows the robotic arm to move along the truss system. The base, which is similar to a railroad cart for the robotic arm, includes a tool used to attach equipment and spares to the base that is similar to the robotic arm's latching end effector. Like the latching end effector, the wires that allow the tool to grip the equipment and spares needs to be lubricated. Robert Satcher used a modified grease gun to add lubrication to those wires and the bearings they were attached to. He then did the same to the latching end effector of the Japanese robotic arm. The end effectors of the shuttle's larger robotic arm, which Robert Satcher was riding, were lubricated in spacewalks earlier in 2009. Prior to the second spacewalk Atlantis robotic arm operators Leland Melvin and Robert Satcher lifted Express Logistics Carrier 2 (ELC-2) out of the shuttle payload bay. 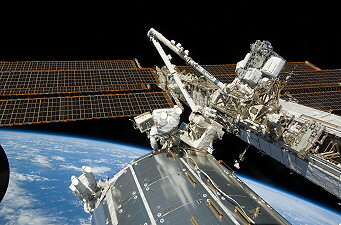 The shuttle arm handed off the carrier to the International Space Station robotic arm, which installed it on the Starboard 3 segment of the stations truss. The nearly 14,000 pound (6,350 kg) carrier contains spare equipment that will help prolong the lifetime of the space station. 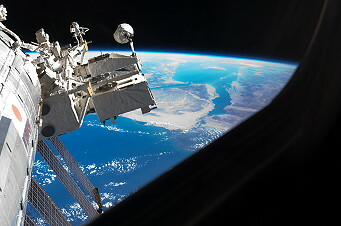 The second EVA by Michael Foreman and Randolph Bresnik occurred on November 21, 2009 (6h 08m) to install the GATOR (Grappling Adaptor to On-Orbit Railing) bracket to the Columbus laboratory and an additional ham radio antenna. They installed on the truss an antenna for wireless helmet camera video. They also relocated the Floating Potential Measurement Unit that records electrical potential around the station as it orbits the Earth and deployed a bracket to attach cargo on the truss. Michael Foreman and Randolph Bresnik spent the entire second spacewalk working together. They started by installing a GATOR assembly on the Columbus module. GATOR is part of a project to demonstrate two different types of Automatic Identification System receivers, which is an existing system that's currently used by ships and United States Coast Guard's Vessel Traffic Services to exchange data such as identification of the ships, their purpose, course and speed. The assembly also includes an antenna used for HAM radio. The GATOR assembly includes two antennas, a cable harness and two clamps. To install it, Michael Foreman and Randolph Bresnik retrieved the assembly from a tool box in the shuttle's cargo bay and carried it to Columbus. Michael Foreman connected the assembly to its power source and wired tie its cables into place, while Randolph Bresnik extended the antennas and then installed them on the appropriate handrails. The antennas were secured with two bolts apiece. The next tasks on the spacewalkers' agenda were the relocation of the station's floating potential measurement unit, a tool that measures the affect the station's solar arrays have on arcing hazards and verifies that the controls that prevent arcing hazards are working. The hardware was moved from the innermost starboard truss segment to the innermost port segment. Three connections were disconnected from the S1 truss segment and reconnected to the P1, and one bolt hold the hardware in place. Michael Foreman and Randolph Bresnik then moved to the S3 segment of the truss, where they were setting up the first of two cargo attachment systems the spacewalkers were scheduled to work on during the mission. This task was originally scheduled to be completed on previous missions, but for various reasons was delayed. The STS-127 spacewalkers completed the deployment of a similar cargo attachment system on the P3 truss segment, but had to leave the set up two S3 systems for this mission. And on STS-119 a jammed detent pin on the first of the systems prevented them from doing deploying the P3 system. A special tool was built to assist with the deployment. The STS-127 spacewalkers were successful in clearing the jam. Michael Foreman and Randolph Bresnik had the same tool on hand for use; however, the STS-128 spacewalkers were able to deploy a similar cargo attachment system without any issues. The system, which will allow future missions to store spare parts, like those that Atlantis delivered to the station during this mission, on the station's truss segment for future use. To set it up, the spacewalkers first removed two truss braces blocking access to the system. That allowed them to swing the system out, replace the braces, and attach the system to the outside of the truss. In the final task of the spacewalk, Michael Foreman and Randolph Bresnik were installing a wireless video system external transceiver assembly, or WETA, on the same segment. 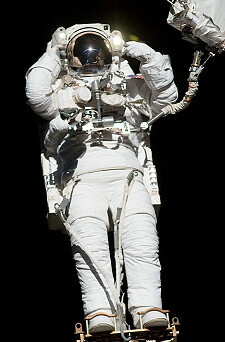 WETAs support the transmission of video from spacewalkers' helmet cameras. To do so, Michael Foreman removed a dummy box currently in the location, and then attached the WETA to a stanchion. Randolph Bresnik connected three cables to the assembly. 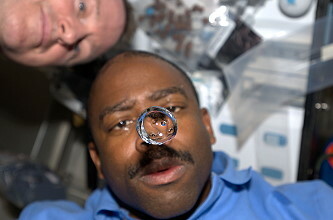 The third and final EVA by Robert Satcher and Randolph Bresnik was performed on November 23, 2009 (5h 42m) to install a new oxygen tank on the Quest airlock and the next set of the "Materials on International Space Station Experiment", known as MISSE-7A and 7B, on ELC-2. They worked the heater cables on a docking adapter in advance of the Tranquility node's installation on Unity's port side and deployed another cargo platform on the truss. Robert Satcher began by moving the high pressure gas tank delivered by space shuttle Atlantis, from the external logistics carrier that it arrived on to the Quest airlock, where it will someday be used to pressurize and depressurize the airlock for spacewalks and to supplement the space station's atmosphere if needed. He prepared the airlock for its arrival by closing a valve on one of its current high pressure gas tanks, and then moved to the logistics carrier on the S3 segment of the truss to pick up the new tank. He unlocked the two handles holding it in place removed it and, with the help of Randolph Bresnik, handed it off to the station's robotic arm to carry it to the airlock. While it was on the move, Robert Satcher made his way back to the airlock to remove two micrometeoroid orbital debris shields and store them out of the way. When the tank arrived at the airlock, both Robert Satcher and Randolph Bresnik climbed into foot restraints to be able to take the tank back from the robotic arm. Then the two moved it into place, and Randolph Bresnik rotated the handles into their locked position. While Robert Satcher put away his foot restraint, Randolph Bresnik finished installing the tank by removing some insulation and connected its gas line to the airlock. He opened the tank's valve to check its connection but closed it again before he left the site in order to perform a leak check of the tank. When Randolph Bresnik was not doing his part with the high pressure gas tank relocation, he was installing the seventh Materials International Space Station Experiment, or MISSE 7. He retrieved it from the shuttle's cargo bay at the beginning of the spacewalk and carried it with him to the express logistics carrier, so that he could assist with the retrieval of the high pressure gas tank. Then, while Robert Satcher and the tank were making their way to the airlock, Randolph Bresnik stayed behind and installed the experiment on the logistics carrier by connecting two cables. He also deployed the experiment by opening the two canisters it's contained in. The final task of the STS-129 spacewalks was to deploy another cargo attachment system on the S3 truss segment, this time on the zenith, inboard side of the segment. The steps involved were very similar to those of the cargo attachment system set up on the second spacewalk. On flight day 9 final internal transfers continued throughout the day. Around 1,400 lbs (635 kg) of water from Atlantis to the Space Station was handed over. During 5 days of joint work, the crews also transferred 2,100 pounds (953 kg) of to be returned experiments and items. Aboard the Destiny laboratory at 15:00 UTC shortly after a joint crew photo, Frank De Winne, the first European Space Agency commander of the Space Station handed over his command to astronaut Jeffrey Williams. The Change of Command Ceremony was the first-of-its-kind command handover during a shuttle mission on the ISS. At 17:43 UTC, Atlantis' astronauts bid farewell to the Station's crew inside the Harmony module and crossed the threshold into the shuttle. The hatches between space shuttle and the International Space Station were closed at 18:12 UTC in preparation for the Atlantis' undocking. At undocking time, the hooks and latches were opened and springs pushed the shuttle away from the station. Atlantis's steering jets were shut off to avoid any inadvertent firings during the initial separation. Once the shuttle was about two feet (61 centimeters) from the station and the docking devices were clear of one another, Barry Wilmore turned the steering jets back on and manually controlled Atlantis within a tight corridor as the shuttle separated from the station. Atlantis moved to a distance of about 450 feet (137.2 meters), where Barry Wilmore began to fly around the station. Barry Wilmore circled the shuttle around the station at a distance of 600 - 700 feet (182-213 meters). Once the shuttle completed 1.5 revolutions of the complex, Barry Wilmore fired Atlantis's jets to leave the area. 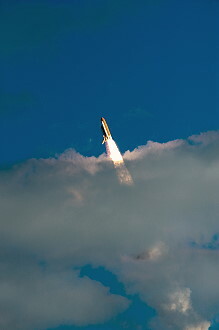 The shuttle began to increase its distance from the station with each trip around the earth while ground teams analyzed data from the late inspection of the shuttle's heat shield. However, the distance was close enough to allow the shuttle to return to the station in the unlikely event that the heat shield is damaged, preventing the shuttle's safe re-entry.